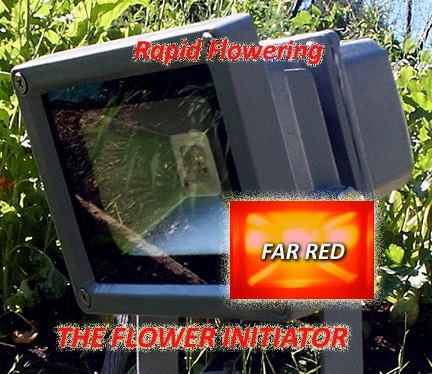 You can't fool mother nature, except with the Flower Initiator! Accelerate Flower development, improve yield and quality of Cannabis Bud production. What could you accomplish with two extra hours a day? 20 Watts Covers an 8' X 8' area at 4' above the canopy, up to16' X 16' at 7.5' above the canopy. Run this little wonder for a short period each day, while flowering, let's you to run your lights for 1.5 to 2 hours longer each day. At 13.5/10.5 is like 13.5/12.5, it's kind of like having a 26 hour day day! Flowering is controlled by the length of the night. A Short Day Plant, Marijuauna for example, will normally require a night of roughly 12 hours in length to begin Flowering. Under normal conditions a chemical, Phytochrome, must remain in it's active, Pfr, state for a minumum of 10 hours, but it takes two hours for it to change state, therefor the need for a 12 hour night. With the Flower Intitator the Phytochrome state changes in moments rather than in two hours, so, with a 10 hour night the plant to responds as if the night is 12 hours long. This is why a 13.5/10.5 cycle is like a 13.5/12.5 cycle, it's like having a 26 hour day. You get the benfit of a longer day and an effectively longer night too. Day use is not recommended, although some growers do say they run them for 5 minutes every hour with positive results, my understanding is it causes stretching. Some like this with young starts, we are neutral on the idea. It works equally well Indoors, Outdors and in the Greenhouse! The Flower Initiator Effect is built into the Inda-Gro Pfr Pontoon. Relevant video materials: There are videos to view near the top of each product page. The Flower Initiator, theory and function. The FLOWER INITIATOR Grow - Day 51 Of Use - The Flush Has Begun. Your Grow Light Source. Inda-Gro Magnetic Induction Grow Lights, HID Grow Light Ballasts, DEEP RED Bud Booster Grow Lights, FAR RED Flower Intiator Grow Lights, DEEP Blue Grow Lights. The newest stuff!